Frédérique Molay's story has something truly special. Her first published novel took France by storm when she won the Prix du Quai des Orfèvre—this is The 7th Woman, which we were so very proud to count among our first titles. She then wrote Crossing the Line and The City of Blood. However, after that, for reasons beyond her control and related to the occasionally obscure world of publishing, she lost her French publisher, and almost stopped writing altogether. I told her to send me the manuscript and, if nothing else, we would bring it out in English. We did better than that. It was published by Amazon Crossing in January in English—Looking to the Woods, and at the same time by Amazon Publishing Europe in French as—Copier n'est pas jouer. As of yesterday, Copier n'est pas jouer is in paperback as well in France, published by City Editions. And Frédérique spent last weekend at the Paris Book Fair, as did both books. 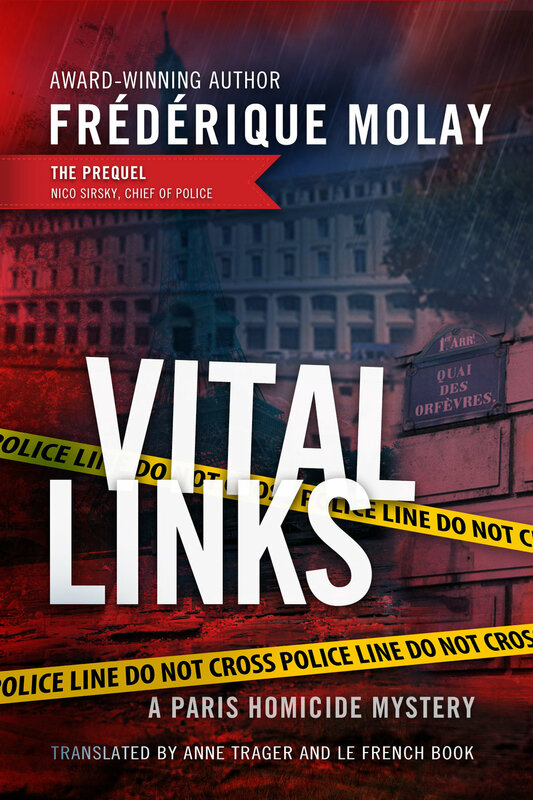 Frédérique Molay has reaped awards and praise for her Paris Homicide series. These mysteries set in Paris "blend suspense and authentic police procedure" says Paris mystery writer Cara Black. As we prepare the translation of the fourth book in the series, I went to Paris to see Frédérique in her current place of work—the French Senate. It seems part of her secret comes from leading a double life of writer and politician, which gives her a front-row and participative view of the French legislative system, and by extension the legal system. Anne Trager and Frédérique Molay in Paris, at the French Senate. Frédérique, who is now 47 and the mother of three grown children, graduated from the French grande écolé the Institut d'Études Politique and has a Master's degree in Business Administration. She began her career in politics and administration as chief of staff for a commission of the French National Assembly. She then worked for local government in Burgundy. In 1998 she ran in the European elections, and in 2001 was elected in Saône-et-Loire. At the height of this brilliant political career, Molay was also writing crime novels and won France's prestigious crime fiction prize the Prix du Quai des Orfèvres for The 7th Woman, which went on to become an international bestseller. She took a break from politics to write Crossing the Line and The City of Blood, two other titles in the Paris Homicide series. In addition to being a knight in the Confrérie des Chevaliers du Tastevin—an order of wine lovers who promote Burgundy wines—from 2011 to 2013, Frédérique taught French in middle school, sharing her passion for writing with young teens. The political virus never left her, however, and in June 2015, after finishing the French manuscript of Looking to the Woods , Frédérique returned to politics, working as chief of staff for a newly elected senator. She now splits her time between Paris and Chalon-sur-Saône, between police procedurals and politics. Thanks to this double life, she gave me an inside tour of the French senate, where I saw Napoleon's throne in the gilded Salle des Conférence, visited the magnificent library with paintings by Eugène Delacroix, and took the back stairs to the Senate Chambers. I'm wondering if she will ever write a Paris Homicide mystery that takes place in this palace the now houses the Senate—the Luxembourg Palace was built by Marie de Medici.